Welcome to Ravnica. Welcome back, that is. This seems to be a motif of Magic: revisiting old haunts, often with new twists. If we look more deeply, Return to Ravnica is less of a return than a revolt from Ravnica. While superficially similar, the mechanics, themes, and ideas are a rejection of what we found in Ravnica. Yes, the Guilds exist. Yes, hybrid cards are here. Yes, dual lands and mana producing artifacts are here. But what’s not here are the incredible mechanics, top tier creatures, and powerful bombs. Ravnica was a set of huge spells, potent engines, and broken mechanics. Ravnica was the home of Dark Confidant, Life from the Loam, Remand, Dredge, and Golgari-Grave Troll. It was the set of Darkblast, Seeds of the Past, Flame-Kin Zealot, Stinkweed Imp, and Muddle the Mixture. This set is far more timid in terms of the splashy spell. Epic Experiment and Jace, Architect of Thought highlight and exemplify the limitations of the set. These are cards that want to be great, that could be great, but are just a hair away or a subtle limitation from reaching that aspiration. In contrast to the bold mechanics of the Golgari or Dimir from the original Ravnica (Dredge & Transmute), we have weak and anemic mechanics that are, admittedly, flavorful, but far less interesting in the older formats. If there is a card from the original Ravnica era that reminds of this new Ravnica, it’s Dimir Cutpurse: a creature that is almost, but not quite good enough. This new Ravnica features plenty of near playables, aggressively costed gold cards that demand attention, but perhaps not a spot in your 75. But perhaps most surprising of all, and certainly the most subversive to the original Ravnica, is the fact that the best Eternal cards from this set aren’t threats, but answers. Again and again, the cards that stand out for Eternal play aren’t huge bombs, flashy spells, or dangerous mechanics, but exactly the opposite: brutal hosers, stalwart answers, and utility tactics. Could that be more different than the original world of Ravnica? • Temporal Mastery has appeared in 2 Vintage top 8s. • Griselbrand appeared in 11 Vintage Top 8s. • Cavern of Souls appeared in 18 Vintage Top 8s. • Reforge the Soul appeared in 1 Vintage Top 8. • None of the other cards appeared in a Vintage Top 8. The three cards that I predicted were playable and would see play did in fact see Vintage Top 8 action. Only one of the 4 cards I felt were playable, although wasn’t convinced would see play, actually saw play. I batted 100% on my predictions of what would actually see play with no major omissions. Much my prediction about Temporal Mastery pertained to Legacy, and while Temporal Mastery hasn’t broken the format, it has seen plenty of Top 8 action. One thing that seems to have played out is the fact that the efforts to set up Temporal Mastery just about equal or slightly exceed the admittedly tremendous benefits, despite the fact that it is a 4 Brainstorm format. There are 274 cards in Return to Ravnica, with 45 reprints, including the 25 basic lands. In my last few set reviews, I reviewed every single card. The reason for doing so is to ensure that I missed nothing. That resulted in page after page of tersely explaining the obvious. In this article, I will return to the older and more traditional approach: discussing only the cards that are of interest, but a more in depth discussion of each of those cards. As was the case in the original Ravnica block, the emphasis of this set is multi-color spells and creatures centered around bi-color guilds. Return to Ravnica features five of the popular guilds: Azorius (UW), Izzet (UR), Rakdos (BR), Golgari (BG), and Selesnya (GW). There are five new keyword mechanics in Return to Ravnica; one for each guild. I will briefly go over them and discuss their inherent applicability for Eternal formats. Detain: Detain is a tempo mechanic that may actually be useful in Eternal formats. Tempo matters, and having a comes-into-play ability that essentially turns off another card is potentially quite useful and disruptive. It’s too bad that this mechanic cannot detain lands. If it did, detain could be a quite useful indeed. Overload: Overload is a bit like Kicker: it multiplies the effect of often simple cards if you pay a huge additional amount. Therein lies a flaw: it’s not likely that you’ll have the mana to pay the Overload cost, especially in Legacy. You would sometimes have the mana in Vintage. But the real flaw is that the initial effects are so innocuous – often combat related – they they have limited Vintage relevance. Unleash: Unleash, being an ability that is primarily related to the relative strength and combat abilities of the creature, and therefore limited to creatures, is largely irrelevant for Eternal, and Vintage in particular. This is a disappointing ability for the Rakdos guild. 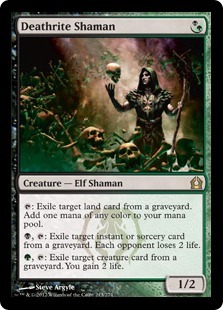 Scavenge: Scavenge is perhaps one of the most modest graveyard abilities we’ve seen in a long time. All it does is pump up creatures in play, which is virtually useless in Eternal. Populate: Any mechanic reliant upon tokens in play is inherently limited for Eternal formats, and should prove to be irrelevant for Eternal. Abrupt Decay – This card is unreal in Legacy. It can not only answer Counterbalance, but it’s a perfect tempo answer to threats like Tarmogoyf or Knight of the Reliquary. It may now be time for GW Aggro-Control decks to branch out into black to meaningfully support amazing tactics like this. In Vintage, this card doesn’t destroy anything that’s truly important in most game states. It can’t kill a Lodestone Golem, a Jace, a Bazaar of Baghdad, or a Blightsteel Colossus. The uncounterability matters, but ironically is less important than in Legacy, where cards like Daze and Counterbalance are more heavily played. Legacy playable, but won’t see play in Vintage. Deathrite Shaman – I believe this card is Vintage playable. The debate over this card has been ferocious, but I’ll be honest – I haven’t read much of it. I overlooked this card in my first pass through of the spoiler. I only tuned into it once Kevin Cron and I did our most recent So Many Insane Plays Episode 18 podcast, where we reviewed Return to Ravnica, the unrestriction of Burning Wish, and more. This is what I get for not reviewing every card in the set! This card, like all of the other cards similar to it with multiple functions, that I reviewed already, really puts into focus the value of versatility. Please see my review of Izzet Charm for a more in depth analysis of this principle. But the idea is simple: while the individual elements of this card may not rise to Vintage playability, does the sum in total push it over that line? I believe so in this case, if only because this card actually offers more than 3 effects: it actually offers 7, including the warm body. This card can exile lands, sorceries, instants, creatures, gain 2 life, cause the opponent to lose 2 life, and adds a mana to your mana pool. Each of those things matter. You might not believe it, but Birds of Paradise effects are quite good right now. A Birds can be played on turn one with just a land and a Mox under a Lodestone Golem and a Thorn, and can help accelerate out spells like Tinker or Jace. If you are playing with fetchlands or Wasteland, you can probably get a nice, immediate Birds effect. Generating mana with this Shaman might not be as consistent as with ]Noble Hierarch or Birds of Paradise, but it’s not inconsistent either. And, situationally, removing land is more important than generating mana. This card can stop Strip Mine recursion with Crucible of Worlds, for example. Exiling Instants or Sorceries from graveyards is clearly relevant in a format where Snapcaster Mage and Yawgmoth’s Will see heavy play. It’s a non-trivial fact, though, that 2 life is sucked from the opponent as well. If you are applying pressure, this card will contribute to it while disrupting the opponent. The third ability is critical as well. Taking out a creature can help against both Goblin Welder/Baleful Strix recursion, and more importantly, Dredge. Taking out the first turn Golgari Grave-Troll can be huge. In sum, the first ability is good against both Shops (especially in the early game), the second ability is good against Control, and the third ability is good against Dredge. The real limitation on this card, in my opinion, is that you have to play both black and green. You have to play black to get the second ability, which is the most important ability by a strong plurality. Dryad Militant – Dryad Militant is one of the more exciting cards from Return to Ravnica. This studly creature will see play in both Vintage and Legacy. Dryad Militant is clearly playable in Vintage. Not only is it as efficient as the small-l legendary Savannah Lions, but it is crucially disruptive as well. Although Workshop decks do not play with Sorceries or Instants, virtually every other archetype in the format does, and almost all of these archetypes interface with the graveyard in some way: either through Yawgmoth’s Will, Snapcaster Mage, Dredging, or other forms of recursion. Although we are no longer in the days in which 2/1s for 1 are Vintage playable, there are plenty of smallish disruptive bears that see play. Thalia, Ethersworn Canonist, Meddling Mage, Gaddock Teeg, Leonin Relic-Warder, Qasali Pridemage, Aven Mindcensor, Leonin Arbiter, True Believer, and many more 2 power white creatures currently see play in Vintage or have seen significant play. Together, these cards fuel Aggro and Aggro-control strategies of various color permutations, such as mono-white, WG, WGB, UW, or UGW. Despite a spate of great printings in this mold (i.e. 2cc 2/2s with a great disruptive or interactive ability) in the last half decade, there have been obvious gaps and unfilled needs. The most obvious is a useful one-drop. It is not always the case that these decks will draw a Mox to fuel a turn one play, such as Thalia. And in many, if not a majority of cases, the specific mana requirements of a Gaddock Teeg, Qasali Pridemage, or Meddling Mage make these cards unlikely turn one drops even with a spare Mox. The lack of vital one drops meant that cards like Grafdigger’s Cage and Thoughtseize were particularly important to the beatdown versions of these archetypes, and that Spell Pierce and Flusterstorm were more important to the blue Aggro-control versions of these archetypes. These decks needed one drops, and had to fill that design space with non-creature spells. Some Fishy decks ran Cursecatcher or even Sage of Epityr in those slots, but these were not ideal 1 drops. Neither is Noble Hierarch, another creature that sometimes sees play in Vintage. Dryad Militant is finally a one-drop creature that everyone can be excited about and happy to have, because of the disruptive ability. If Fish decks and Beatdown decks in Vintage have any single need, it is for a card that fills this niche: a one mana, disruptive 2 power creature. Given the speed and violence of the Vintage format, survival is the first order of the day. A creature that affects the game state in a meaningful way, as Dryad Militant does, and can be reliably played on turn one, is a much needed printing. Although it is no longer respected and feared to the extent it once was, Yawgmoth’s Will is and remains one of the best, if not the best, spell in Vintage. This card hoses Yawgmoth’s Will from the outset, and does so, unlike Grafdigger’s Cage, on the body of a meaningful source of damage. It is the interaction of these two facts: the meaningful source of damage and the disruptive function that makes this card playable. Land, Qasali Pridemage. Attack for 3 (Exalted trigger). Land, Tarmogoyf. Attack for 4. At this point, you are easily on target to win the game by turn 5. Dryad Militant does 4 more damage than any other playable one-drop by turn 5. That’s easily the difference between winning on turn 5 and turn 6, a chasm in Vintage. 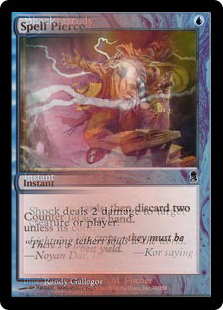 Moreover, the disruptive effect may keep a Snapcaster Mage from recurring Ancestral Recall or Time Walk, or a Yawgmoth’s Will from firing off early. Dryad Militant also hoses more marginal, but historically important spells, such as Intuition (for Accumulated Knowledge) or Gifts Ungiven (which barely functions with Dryad Militant in play). Equally important, Dryad Militant is an easy tutor target with Green Sun’s Zenith. Just as important as it use against blue decks is its effects against Dredge. RUG Delver, Bant, and Fish decks are at a tremendous disadvantage against Dredge strategies because they lack the best graveyard hosers, which are all black. Dryad Militant is not only a meaningful clock, but it is one of the best anti-dredge spells they now have. Dryad Militant not only prevents the opponent from ever playing Dread Return, it also stops Cabal Therapy from being Flashed back, as well as cards like Darkblast or Ancient Grudge from being reused. Since these spells can’t be flashed back, it indirectly slows the production of Bridge from Below tokens, which are usually the critical source of damage. In Vintage, the best disruptive bears are white creatures, followed by green. This creature is both, without requiring you to play both. That simply means he will see even more play than he otherwise would. In Vintage, this card is either mainboard or sideboard material in Noble Fish and RUG Delver for its usefulness against Dredge alone, and is a serious consideration, if not auto-inclusion in the 75 of white-based Aggro decks for the same reason. He’s almost certainly a serious consideration as a one-of in Bant as well, as a Green Sun’s Zenith utility target, if nothing else. In Legacy, the story of Dryad Militant is somewhat different. Dryad Militant neuters my favorite strategies, from Lands to Ill-Gotten Gains. This is a dark day for Loam strategies, as decks like Lands or Aggro Loam rely heavily on the uncounterable dredging engine power of Life from the Loam. This card single-handedly neuters these strategies for one mana. Lands, one of my favorite Legacy archetypes, is possibly rendered unviable as a result. Ditto, this is a one mana creature answer to things like Ill-Gotten Gains and Past in Flames. Likewise, this card strengthens Maverick and similar archetypes against the nasty blue-based Snapcaster decks. This guy not only prevents Snapcaster from being used effectively, but it also can slow the growth of both Tarmogoyf and Nimble Mongoose. If a sorcery or instant never hits the graveyard, then Tarmogoyf will almost always be 2 power less than he normally would be, and will often be stuck as 1 power, without impeding the Maverick player’s game plan. However, the omission of lands with Militant means that they can still build up a huge land count in the graveyard for Knight of the Reliquary. I expect this guy to see Legacy play as well. This table illuminates and clarifies the effect of this card. It also suggests the limits of this card. First of all, it’s evident that playing this spell for 3 or 4 mana is not that great. For RU1, all you can do is flip and play a 1 casting cost spell. For RU2, you get to play two cards – at most – from the top of your library, and they both have to cast 2 or less. That’s marginally better, but hardly abusive. That’s a net of one care, and given the limitation of being able to play just 2cc spells or less, probably not that strong. It’s at five mana that this card becomes interesting, but also prohibitive. There are almost no non-artifact no alternative casting cost, 5cc spells that see any play in Vintage. Tezzeret the Seeker, Ad Nauseam, Mind’s Desire, and Yawgmoth’s Bargain are the primary exceptions, and pretty much the exclusive exceptions. At 5 mana, this card would essentially need to make an argument to join that class. What each of these cards have in common is that they are great card advantage engines. This card has the potential to join that class, even though it might generate less card advantage than the other cards in general, because of the mana advantage built into it as well. At 6 mana, this card can hard cast almost every non-alternative casting cost spell in Vintage. If this card is going to see Vintage play, it’s because we can cast this where X=3 or X=4, and use most, if not all, of the top cards of your library off of it. That raises two related questions: First, how would you manipulate your library to reliably ensure that you can exile and cast the top 3-4 cards of your library? Second, how do you generate 5-6 mana in Vintage? I have in mind two simple answers to both questions: 1) Sensei’s Divining Top, and 2) Grim Monolith/Voltaic Key engine, supported by Mana Drain as well. In other words, this card could be a natural fit into existing the TurboTezzeret engine. The problem is one other limitation of this card: it only allows you to play instants or sorceries for free. It doesn’t allow you to flip Jace and play it for free. That said, there are still meaningful options. What’s really attractive is that you can probably use Transmute Artifact well with this card. If Transmute Artifact were templated today, it would be a casting cost UUX. However, the way it was originally templated means that you pay the difference when it is resolving. You can, for example, reveal a Transmute Artifact, and then pay as much of a difference as you are capable of doing. This brings me to one other, more subtle limitation that probably prevents this card from every seeing play: you have to play the exiled cards immediately as part of the resolution of this spell. That’s a huge difference from, say, Mind’s Desire, which allows you to play the spells until the end of the turn. If it granted that ability, then you could, for example, exile Transmute Artifact, and then use the other spells to find and cast a Grim Monolith, which, in turn, would fuel the Transmute. The sorcery/instant spell limitation and the immediate use limitation really hamper full use of this card. Without these two restrictions, I think it would have a serious chance to join the amazing 5cc & 6cc spells mentioned as a specialized and weaker cousin. With these limitations, I simply don’t think you can generate the gas and punch to justify ramping up to 5-6 mana to cast this spell on your main phase. Sadly, I don’t think this card is playable in Vintage. It doesn’t really allow you to generate huge mana advantage like Show and Tell, Oath of Druids, or Mind’s Desire, and is too limited to be abusive in terms of generating serious card advantage. In Legacy, the problem is simple: this card is obviously too expensive. To get much value from it, you are going to need to spend 5 mana, which is arguably more prohibitive in Legacy than Vintage because of the lack of common and generally efficient mana acceleration. It would also compete with other combo engines in a similar cost slot like Ad Nauseam and Time Spiral. Goblin Electromancer – Goblin Electromancer is the newest iteration in a long line of spell-cost reducers: Helm of Awakening, Medallions, and, then, ’on legs,’ the familiar cycle (e.g. Sunscape Familiar). The original, Helm of Awakening, once saw play in 2000-2002 era Tolarian Academy combo decks. Helm also reduced the casting cost of a suite of draw spells, like Meditate and Draw7s. The drawback to Helm is that it’s symmetrical. In old Extended decks, both Sapphire Medallion and Sunscape Familiar have seen play in Intuition + Accumulated Knowledge decks. The former was particularly useful in the infamous Illusions/Donate deck, which cast Illusions of Grandeur for 3 mana, and then cast Donate on Illusions for just 2 more mana. Sunscape Familiar was also used to reduce Mind’s Desire’s casting cost in a different combo deck. Is Electromancer the newest playable iteration of these effects? Very likely, but much less likely in Vintage. First of all, no cost reducers see play in contemporary Vintage (unless we count Goblin Warchief), nor have seen in play since Helm. My basic theory as for why this is so is as follows: Vintage is replete with mana accelerants. Almost all of these accelerants are turn one plays: From Metalworker to Elvish Spirit Guide to Dark Ritual – these are reliable turn one plays, largely because they cost either 0 or 1 mana. Even fringe mana accelerants that see play, like Grim Monolith, are possible turn one plays. My chief criticism of this card is that it is almost always a turn two play – or later! Because of the strict and specific mana requirements, this card can’t reliably be played on turn one. That fact matters because the mana acceleration already present in the format means that even 4cc spells can be cast on turn 2-3 even without this creature in play. The last card on that list is particularly attractive here, since it deals damage that Electromancer has already begun. That card also has merit since it’s probably the most playable Vintage card on that list. Fact or Fiction sees about as much play as Intuition/AK in this metagame: a very, very marginal amount. The fundamental issue with this card is not that he’s a creature, but that it’s slow. Being a creature is not as much of a problem as it is in, say, Legacy, where creature removal is omnipresent. In Vintage, being a creature is just as good as being an artifact in terms of being a removal target. It can be Lightning Bolted, but not Ancient Grudged or hit by Trygon Predator, or shut off by Stony Silence. The chief problem, in my view, is the interaction of two problems: there aren’t sufficiently good synergies to justify a functional accelerant that can’t really be played reliably until turn two. I could be wrong, but I doubt this card will see any Vintage Top 8s in the near future, although it’s probably playable in theory. Guttersnipe – I find this card far less interesting than other folks. This is an inverse Storm card: you play this first, and then play your spells. That’s the main flaw in this card. Guttersnipe suffers from the same flaws as Kiln Fiend, Quirion Dryad, and that class of cards: it’s better to have the damage at the end of the cycle rather than the beginning. That’s because the draw spells, tutoring, and search that you play finds the threat, rather than the inverse. That’s why I don’t believe this card would see play over Tendrils of Agony or Empty the Warrens. On the other hand, if that were strictly true, then Storm Entity would be better than Quirion Dryad, and it’s clearly not. Dryad is a blocker and meaningful board presence, and Kiln Fiend grows faster than this can ever deal damage. The other possibility for Guttersnipe is in Goblins. The problem is that in a Goblin deck, you don’t have many instants or sorceries. This card might be Vintage playable, but I don’t expect it to see meaningful play. 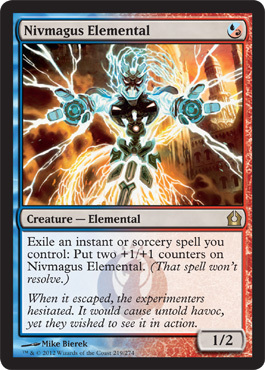 Izzet Charm – This is a fusion of Spell Pierce, Shock, and Careful Study. Each of those cards is Vintage playable, although Careful Study has not seen play in some time, it is still a serious consideration. Any one casting cost blue spell that draws 2 cards is worth a look. Despite the high degree of card celerity, the card disadvantage is a sufficient deterrent for playing the card. Although each of those cards are playable, a critical element of playability is, and has always been, efficiency. This card costs twice as much as you can get for two of these effects in recent years. Therefore, this card poses a simple question: does situational utility and versatility compensate for the increased mana cost? The simple answer is yes, I believe. Think about it this way. You only have 75 card slots available to you between your maindeck and sideboard. For any given slot, there are many cards that you might consider including. The reality is that no card is best all of the time in every situation. The card you select is generally the card you feel will be situationally best most of the time, or at least a plurality of the time. So for example, suppose you have selected 59 of 60 cards from your maindeck, and you have narrowed your last card choice to Careful Study, Shock, or Spell Pierce. How do you decide which card you wish to include? You might, in this example, conclude that Spell Pierce is going to be best 40% of the time, Shock best 25% of the time, and Careful Study best 35% of the time. In that situation, you would normally run Spell Pierce in that slot. This is typically how most careful deck construction occurs. Each card slot as an opportunity cost, which is the benefit offered by another card in that slot. In some cases, it is clear that one card is simply better than any other substitute the vast majority of the time. This is the case with ridiculous cards like Ancestral Recall or Force of Will. But there are even situations where Black Lotus is a bad draw. Only a few cards are almost always great draws. Most cards are included not because they are almost always best, but because they are marginally better than the next substitute. The various Charm cards, which fuse multiple card effects onto a single card, or split cards, which do the same, provide the situational utlility and versatility that a single effect cannot offer. Thus, they have much higher overall utility, and from a design standpoint, a resultingly higher casting cast. The central problem with Izzet Charm is its mana cost. Two specific color mana has a higher real mana cost than 2 in Vintage, because a colorless mana can easily and often readily provided by an off-color Mox. That’s why two mana gold cards have a real mana cost somewhere between 2-3 mana. Part of the value of Spell Pierce, certainly, it is efficiency. Ditto the other spells. That said, I don’t think 2 mana is particularly prohibitive for what this offers. It is discouraging that there are currently no UR spells that see play in Vintage. But there are plenty of 2 mana gold cards, from Qasali Pridemage to Gaddock Teeg, which see play. I believe this card will see play, but not that much. It’s not a meaningful or key draw engine, but it does have enough value to warrant seeing play in the modern versions of The Deck and Landstill. Jace, Architect of Thought – The fourth Jace is worthy of his previous iterations. This is an aggressively costed card that can provide fast and powerful card advantage. The problem is that it’s not Vintage playable. The problem begins with the lack of overall utility. The first ability is almost functionally inert in Vintage – it does nothing relevant. It can’t even stop a Blightsteel Colossus attack from killing you, or even a Lodestone Golem attack from killing Jace. But, most damning, the second ability, the most important, can’t be reused the second turn this Jace is in play without destroying itself. If this card is going to be played, it is because of the card advantage provided by the second ability. If I were to play this card, I would probably activate the mini-Fact ability immediately, and then again the following turn. That can net 3 cards, which is more than any other blue card for that casting cost. That is no a trivial fact. You gain 2 cards immediately (netting 1), and then potentially gain two more the following turn (netting 3). Just as important, however, you get to dig through 6 cards, which is incredible celerity. Had this card started with 5 loyalty, it could give Jace, the Mind Sculptor a run for its money in more aggressive blue decks because (in addition to preventing the opponent from resolving their Jace), because you could activate that ability twice without killing your own planeswalker. That said, I still don’t think this card will see play, and besides the lameness of the first ability, here’s where I think this card really falls apart: the total lack of synergy between effects. The ultimate ability is incredible, but it would take 5 turns of using the first weak ability after resolving this card to activate it. If you can, you can do amazing things, like assembling Voltaic Key + Time Vault, retrieving one half of this combo from your opponent’s library. Another, less significant, problem with this card is the fact that the Murmurs from Beyond/Fact or Fiction ability places the remaining cards in your library – one of the least accessible zones. Had this card put the unselected cards into the graveyard, it would have been an even bigger boost to this card, perhaps even pushing it into playable status. Although this card is not strictly inferior to Jace, the Mind Sculptor in terms of pure card advantage, I do not believe this card will see play, even though some decks can’t get enough Jace. Small changes to this card could have made it playable. As it is now, I don’t think it will see play in Vintage. Likewise, it is probably not good enough for Legacy either. Judge’s Familiar – This card is a safe bet to see some play in Vintage. First of all, Cursecatcher has already appeared in Vintage Top 8s, and this card can be played in decks where Cursecatcher can’t (i.e. non-blue decks, like mono-white or WG). Second, this card can supplement Cursecatcher in Fish decks, by providing even more of this effect and reliably seeing it in the opening hand with all of the additional copies. Finally, this card flies whereas Cursecatcher does not. The only advantage Cursecatcher has over this card is that Cursecatcher is a Merfolk, and would get a boost from Merfolk Lords in specific decks. Like Dryad Militant above, this is an attractive one-drop in decks that lack meaningful one-drops. Expect to see this in white-based hate bear decks. Noble Fish and WBU Fish decks now have the option to run 8 of this effect. They likely will not, given the minimal utility against Workshops. Yet, this card is certainly helpful against Dredge as well, to help protect hateful answers, while also potentially removing Bridge from the Belows from the opponent’s graveyard. Pick up 4 for your Vintage collection. This also has potential in Legacy as Cursecatcher has demonstrated, but while this isn’t a Merfolk the mana cost and flying add increased flexibility. Lotleth Troll – This card is efficient enough and useful enough to be Legacy playable, especially if you can find a recurring creature to pump it. Certainly, cards like Squee, Goblin Nabob can pump this every turn, but it could also be useful with Dredgers, and in Madness variants with cards like Basking Rootwalla and Vengevine. This card can sit on the table, grow, and then, like Knight of the Reliquary, win the game by trumping all other creatures on the battlefield. This strikes me as the kind of card that could ultimately see play in Legacy. In Vintage this card is too slow to make a meaningful impact, as it not the most efficient, nor does it disrupt the opponent in any way. Play land, and cast Nivmagus Elemental. Play land, cast a Mox, cast Preordain, cast Gush, and then cast Flusterstorm, having Elemental munch all necessary copies. Your Elemental can now be at 9 power potentially, and can attack for that, and possibly win the game on turn 3. This has the potential to be broken. I believe this card has a very natural place in RUG Delver, which I fear has just gotten much stronger, and has a new weapon, at a minimum, for the mirror. Perhaps RUG delver can now go straight UR with this monster. Flusterstorm can essentially translate to a Berserk in certain scenarios, while also providing the utility of a great counterspell in other scenarios, making it even stronger. Nivmagus Elemental is clearly Vintage playable, in my opinion. But being Vintage playable doesn’t mean it will actually see much, if any, Vintage play. That I cannot predict. Similar things can be said of Nivmagus Elemental is UR Delver variants in Legacy as well, although the velocity of spells cast will be slightly slower. Rakdos Charm – Rakdos charm melds together an instant speed Tormod’s Crypt, Shatter, and an effect that is fairly unique in Magic. There is no other card in Magic that deals damage to a player based upon the number of creatures he controls. There are cards that can have similar effects (like Heart of Bogardan), but aren’t even remotely similar in templating. As a general matter, we all know how useful both Tormod’s Crypt and Shatter effects are. These are absolutely central and vital tactics in Vintage for combating Dredge and Workshop strategies, two of the most prominent, popular and successful strategies in Modern Vintage. Ironically, the third ability isn’t a throw-away. I expect it would be useful more than 1-2% of the time. My main concern, as with Izzet Charm, is whether the double color mana requirements are problematic. First of all, black and red are secondary and tertiary colors in blue decks. At least Izzet Charm can generate blue quite easily. This is hardly an early play in most Vintage decks. There are almost no existing decks that can easily implement this spell. Second, even if there were, it’s not clear that this would be easily played or optimal in any case. I expect this to see some Vintage play because of the utility it provides, but don’t believe it is a potential staple of the format. Rest in Peace – This is a profound printing that may well be the most important card from the set in the long term. This is a Leyline of the Void that also acts as a Tormod’s Crypt when it hits the board. At two mana, this is eminently playable on turn one, and a surefire Dredge hoser. Any deck in Vintage with white will seriously consider this card, and Legacy decks with white will not be far behind in instantly adding this to the repertoire. This card is so powerful and sweeping that I’m actually concerned Wizards may have gone too far in the other direction of printing powerful graveyard hosers. Had we sat here and brainstormed hosers, we may not have come up with so potent a hoser. My teammates Brian DeMars and Paul Mastriano once attempted to design the ultimate Dredge hoser. I won’t bore you with the details, except to say that I believe this card is even more devastating to Dredge, simply because it not only has the Leyline effect, but also nukes the graveyard when it hits play. That makes it exceedingly difficult to address as a Dredge player. This can be hid on top of the library with cards like Enlightened Tutor and Sensei’s Divining Top, and replayed quickly even if it is bounced with Chain of Vapor. In fact, one thing that is so remarkable about this card is how limited the value of Chain of Vapor is against it. You have to not only get a Cabal Therapy in the graveyard (or be able to hard cast it), but a creature in play to use it on the one turn you have after bouncing it. In that respect, this card may even be superior to Leyline of the Void against Dredge. The only true answers to this are Nature’s Claim, Wispmare, etc. I believe this card to be so potent that may contribute to a modest color alignment. To really hose Dredge you had to play black. Now, the best Dredge hoser is white. Landstill no longer needs black to hose Dredge, or subpar substitutes. It can now play a naturally aligning color and the best Dredge hate yet. This principle extends across the format. Not only is Rest in Peace the best anti-Dredge tactic ever printed, it might be the best white card available in contemporary Vintage. It’s truly a compelling reason to play white, and will undoubtedly affect the color choices made in this format for years to come. How ironic that the best Dredge hoser is printed in the Return to Ravnica, when the original Ravnica spawned Dredge itself. This is most certainly Vintage and Legacy playable. It is now, by far, white’s best answer to Dredge, and in fact, the best answer to Dredge in the format. But it is also more than that. It’s a real bane to Yawgmoth’s Will, Snapcaster Mage, Life from the Loam, Crucible of Worlds, and all sorts of other recursive tactics in Eternal formats. I would pick up four copies for your collection without hesitation. Slaughter Games – Slaughter Games (aka an uncounterable Cranial Extraction) may be deceptively powerful in Eternal formats. Because it cannot be countered, it can be aggressively played on turn two with a Dark Ritual or with other mana acceleration. It can strip out win conditions in narrow decks even more aggressively than an Extract, Jester’s Cap, or Cranial Extraction. That said, this effect almost never seems to see play. Sadistic Sacrament and Bitter Ordeal are probably superior options, and neither sees play, so I don’t expect this to either. Slitherhead – I only mention this card as a very, very marginal Dredge option. As a black creature, this card can be used to fuel Ichorid, and as a one mana spell, can be played off a land. Also, it can be removed from the graveyard to pump an existing creature in play. I don’t expect it to see play in Vintage, and is probably worse as a one-drop than Gravecrawler, but is worth keeping in mind. Supreme Verdict – I am not reviewing this card because of potential Vintage applicability. Despite the very remote possibility of being a UW Landstill card, this is clearly not a Vintage card. However, this card is quite intriguing for Legacy. Wrath of effects see little play in Legacy currently. Terminus, because of its efficiency, is a clear exception, as it can often be cast for only a single mana, sidestepping cards like Cursecatcher, Daze, and Spell Pierce. This card may prove to be exception as well, because it also sidesteps the same cards and requires no setup. Legacy players tend not to over-extend, but they do build to 2-3 and even more creatures on the board. This card is easily a 2-for-1 an often more against many of the most common and important archetypes. It’s even an uncounterable way to get rid of Emrakul! Control decks have a very difficult time surviving in Legacy largely because of the density of excellent tempo countermagic. Cards like Daze, Spell Pierce, and Force of Will are most effective and most lethal when protecting a quick Tarmogoyf or horde of Merfolk. Mental Misstep was so problematic in that respect that it was quickly banned in Legacy. Supreme Verdict is the anti-tempo card: it obviates the tempo countermagic that pervades, if not dominates, the format. This can be played on turn four, and you know that it will resolve, and will clear the board. It’s fast enough to restart the game, and allow you to spend your remaining resources playing clean up on whatever creatures the opponent will play after this clears the board. I believe this is a non-trivial tool for UW and UW x control decks for Legacy. I will be interested to see how this tactic plays out over the coming months in that format. Treasured Find – This card is a notable Regrowth variant. Regrowth is legal in Legacy, and sees no play, so we should not expect this to either. However, it is Vintage where Regrowth has the most potential to recur restricted spells. Recurring Time Walk and Ancestral Recall is an extremely abusive use of Regrowth, and is the main reason it is Restricted. That said, Regrowth sees very limited play as a Restricted spell these days. This card is not likely to fare better, and here’s why. This card’s overall mana cost and specific mana requirements are just about as onerous as Eternal Witness. If one were to design a deck around recurring Time Walk, you would probably play 1 Regrowth, and multiple Eternal Witnesses. With that, you could add Treasured Find. If you can make that deck work – perhaps by using Personal Tutor to find Time Walk – then you may have your place for playing this card. But given how difficult it may be to set up that combo, and how easy it is to disrupt (with Tormod’s Crypt, Extirpate, etc), I am a skeptic. Snapcaster Mage has proven to be a better Recoup, but this is not a better (or even Vintage playable) Regrowth, in my opinion. Vandalblast – A one mana sorcery Shatter, with a possible Shatterstorm bonus? This is reminiscent of Shattering Spree, which has seen play, but doesn’t currently see much play at the moment. Being an instant is a premium against Workshop decks with Tangle Wire, and Ingot Chewer tends to eat up the space at this casting cost. A Vintage possibility for sure, but I’m not confident is it will see more than marginal play.